Fabian Stevens was born in the United Rigel Colonies, where his family operated a shuttle business. His mother was a musician, as were her mother and grandmother. Stevens was serving on Deep Space 9 in 2370 when Martus Mazur's probability altering device was affecting the station. He had bet that Julian Bashir would win the racquetball game and he lost a large amount of money when Bashir lost. In 2372, he was assigned to the USS Defiant, where he befriended fellow engineer Enrique Muñiz. After Muñiz was killed, he opted not to re-enlist, and returned to work in the family business. However, he found he missed Starfleet, and rejoined in 2374. 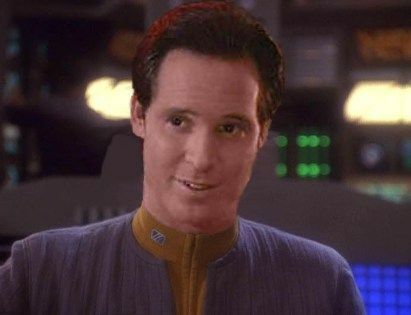 He was assigned briefly on Mars, and expected a posting to the Utopia Planitia Fleet Yards before learning there was an opening with the Starfleet Corps of Engineers team aboard the USS da Vinci. Fabian Stevens joined the da Vinci crew in 2374. He became close friends with Commander Kieran Duffy, with whom he shared a similar sense of humor. Their sense of humor got them into trouble at a bar on Syrinx III with some humor-impaired Tellarites. In early 2376, Stevens was surprised when Lieutenant Commander Domenica Corsi seduced him and the two spent a night together. (SCE eBook: Cold Fusion) Despite Corsi's insistence that this was a one-time thing, Stevens pursued the unconventional relationship. Following the death of Duffy at Galvan VI, Stevens accompanied Corsi home to her parents' house on Fahleena III, solidifying their friendship. Eventually, Corsi was able to open up to Stevens about an ill-fated romance from her past, and to finally accept the romantic nature of their relationship. Stevens mourned the death of Duffy for a significant period, while at the same time trying to help Sonya Gomez overcome her own grief over his loss. At one point, while the two discussed her frustration over her inability to move on with her romantic life, Gomez kissed Stevens. This breach caused an uneasy strain in their friendship for several weeks to follow, as well as causing him some guilt regarding Corsi. Stevens and Corsi remained together for several years to follow, though until her death in late 2379. Stevens suffered a near-death experience in 2377 after being infected by an Ardanan parasite, which gradually took over his brain, leaving him paralyzed and threatening his life functions. He was saved when Dr. Elizabeth Lense put him into a coma, thus depriving the parasite of stimuli and killing it.